Let me start by saying that the title of this piece is a little misguiding. *cough cough* 136 zombie kills. Just saying. It wasn’t a real gatecrash in the true sense of the term. More like an invitation extended on which I acted. Alright, I was an invited guest. But it made a really good title. I recently returned from a trip to Melbourne, during which I covered the swarm conference (it’s my annual national-scale giving back to the community project) through live tweets and blog posts of the two days it ran. It is always an eye-opener and an educational experience, sharing the room with so many amazing minds in the community and social media management arena. If you missed my work, or if you want to learn more about the only annual Australian conference for Online Community and Social Media Managers, you can check them out here. I also took some time off to just enjoy the sight and sounds of Melbourne. I had the chance to catch up and hang out with my very good friend, Venessa Paech. If you don’t know this amazing lady, then you’re missing out. She is a wealth of knowledge concerning community management and a constant source of awesomeness. Venessa is Senior Manager for Community & Content Strategy with REA Group, and I was invited to pop into the office to catch up with her and the crew after swarm. What I learn was very valuable indeed. Lessons I learned at REA Group. 1) Work hard, but make time for play. While many workplaces pay lip service to facilitating the work/life balance of their employees, few really offer ways in which to truly help. Even fewer employees seem willing to accept such offers. Whether it’s not wanting to appear unable to cope, or if it’s a lack of willingness to let their guard down, employees are not striking a true balance in their life and employment. 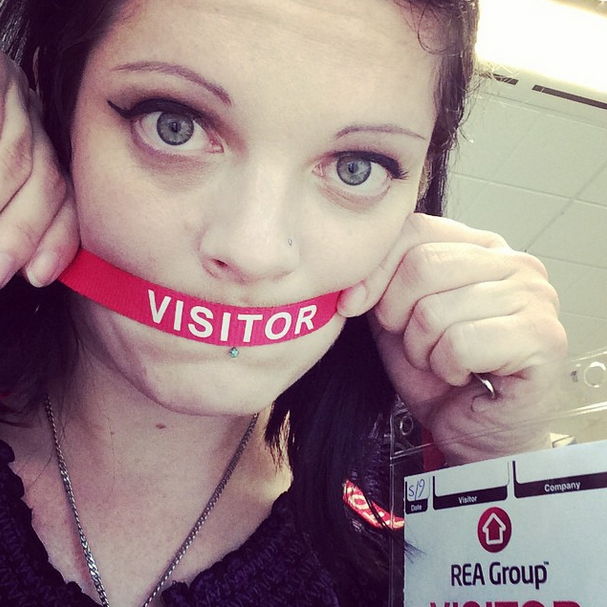 REA Group has made some great moves to endorsing and encouraging fun in the workplace, with an emphasis on helping their employees strike their own sense of balance. Whether it’s taking time out to sit on the couches in breakout areas and play Guitar Hero, or if it’s grabbing the Oculus Rift gear to thwart zombies, these guys have really taken the “Balance in all things” phrase to heart. They even hold classes in the office for Zumba and subsidise gym memberships, showing that healthy choices are all part of striking the balance employees need and want in their lives. 2) “Hot-desk” isn’t a dirty word. Sure, there are some roles in which you simply can’t have a different desk every day. sometimes, you really do need your own place and for that place to be always yours. When possible, and properly implemented, hot-desking can prove to facilitate employee productivity. It can stop the silo-ing effect of nesting, and helps teams to find a place that works for them and their particular efforts. It also means that if that person who insists on clicking their pen ad nauseum (or any other really annoying habit that you simply can’t stand) isn’t so offended when you simply up and shift to a new position. 3) Employee health IS an employer’s concern. We often forget that, unless properly managed, one of the cons to increased work hours is a decline in employee health. With office hours on a general increasing trend, it falls to the individual AND their employer to ensure that health, physical and mental, is protected. Walking meetings, standing desks, opportunities to move around, offering exercise incentives, allowing regular breaks, ensuring good office ergonomics and allowing flexibility in work conditions are all ways in which employers can genuinely assist their employees in finding their own ways to ensure good health. 4) Your workplace is a community. We spend so much of our time at work, but often forget that the people we work with are people too – people with feelings and families and a set of ethics and values. For that reason, your workplace is a community of people, each bringing valuable societal information to share. The moment you start looking at your colleagues in this way, work becomes less of a place to hack away at tasks, and more a place of collaboration and communal problem-solving that makes everyone feel good about the work they are doing. 5) Helping people is good. REA Group holds regular Hackathons. These Hack Days are a chance for people to pitch ideas they want to work on, for customers, or as a way of giving back to their community outside of work. Whether it’s setting up a national volunteer database, or helping homeless people find a safe place to sleep, allowing employees to work on tasks that benefit someone outside of the workplace not only provides exposure for your company, but also shows that you recognise your place of privilege without society and are wiling to use that position for the greater good. REA Group is a huge crew, but these lessons aren’t only for big organisations. They work and have meaning on smaller scales too. And every work place should have zombie-smiting sessions. This entry was posted in Rant and tagged balance, Community, community manager, employee responsibility, employer responsibility, employment, health, responsibility, zombies.